Mumbai: More than 40 early childhood education graduates were acknowledged at New Zealand Tertiary College (NZTC) India’s graduation ceremony. 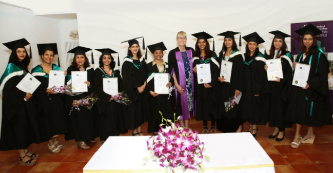 The ceremony was held in Mumbai on Sunday, 5 November, with NZTC Chief Executive Selena Fox travelling from New Zealand to share in the festivities with graduates and their families. “This seventh NZTC India graduation is an extraordinary achievement for a New Zealand early childhood education college,” she said. The college celebrated the expansion of its postgraduate offerings by honouring Helen Sharrock, the first graduate of the Postgraduate Certificate in Education (Leadership and Management). A number of special commendation awards were also presented to graduates who excelled in their studies, with the most outstanding student for the Certificate in Early Childhood Education (Level 5) awarded jointly to NZTC’s own staff member Sushma Nair and Sheeba Roshinkumar. Graduate speaker Karuna Mangharam shared her study journey with fellow graduates, pursuing a Bachelor of Education (ECE) to support her directing of a pre-primary school that she and her sister started in 2010. “I found the NZTC degree to be most suitable for me because it was an international college with a local presence. I couldn’t have gone ahead course after course if I didn’t have the support from the NZTC Selena Fox (centre) with graduates.support team,” said Mangharam. 2017 was a big year for NZTC. It celebrated its 35-year anniversary, and expanded its programme offerings beyond early childhood teacher education to health and wellbeing programmes.